It was the blasted binki. Apparently a nice little side-effect of sleeping on your tummy is that your pacifier is propped up by the mattress and cannot fall out of your mouth as easily. Brilliant. At that point I didn't even care. I was actually getting more than 30 minute increments of sleep and was beginning to feel like a human being again. 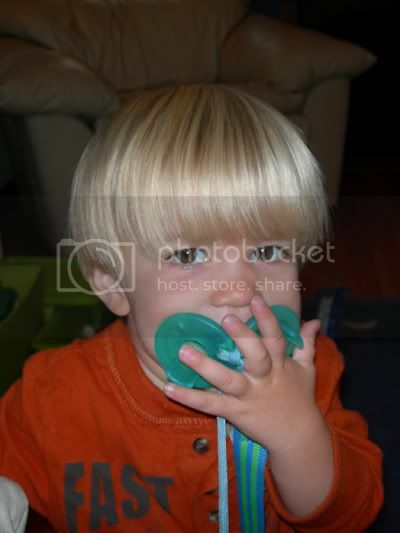 Once he turned 3 we started restricting his usage in an effort to someday, hopefully get him to stop. But just like a true addict, he would find all the secret hiding places we had and sneak off into a corner to take a few hits off the binki and put it back before we would notice. He wasn't super stealthy though. I always caught him. After battling the binki for 3 years, 6 months, and 22 days he decided to finally give it up. Just like that. 5 days ago I was pretty certain that he would be taking it off to college with him and hiding it in a pocket at his wedding someday. But he surprised me. He told me it was broken and no good anymore (apparently there was a small hole where he had chewed through) and that it needed to go in the garbage. I actually gasped as I watched him throw it away and nearly went dumpster diving to retrieve it thinking surely my night was going to be torturous and bring me back to the newborn days. But no. He did it. He went to sleep without it. And managed to stay asleep all night long. The next day he asked me for it. He said he wanted it back and that he needed it again. But I just kept re-assuring him that he was a big boy and he could do it. And reminding him that HE was the one who threw it away. Not me. It's been 5 days. I think we have finally broken the addiction.